Cisco IOS provides QoS on both layer 2 (that is handled by cos) and layer 3 (ToS / DSCP). It is also worth bearing in mind that DSCP is backward compatible with IP Precedence. 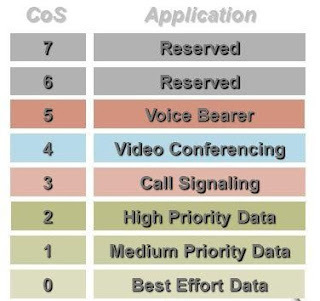 The same priority mapping can be applied to ToS as above. mls qos trust cos pass-through # this will also ensure any existing DSCP values are not ovewritten by the switches CoS to DSCP map! It is also important to note that this also applies to upstream switches - for example if I wanted to ensure priority delivery of the frame when it hits the core switch I would need to ensure that the same configuration is applied on the uplink port on the core switch. 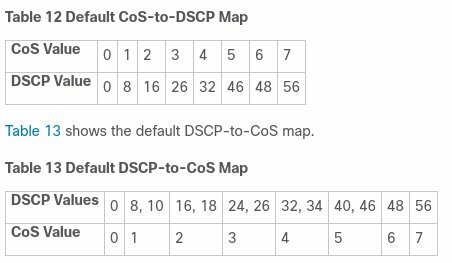 These mapping provide a way to ensure that a (for example) frame that is marked with a CoS priority value of 5 will also have an equivalent DSCP value when it hits a layer 3 device / router. Unfortunately on the 2960X you are unable to classify specific TCP / UDP protocols - so instead we have to define address ranges / ports in order to categorise traffic we wish to apply QoS to. 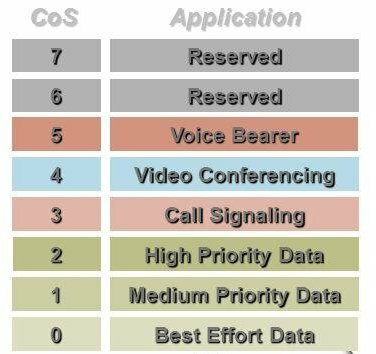 Now we will set the CoS priority on our traffic - in some cases end user devices such as VoIP phones can do this for us - however for the purposes of completeness I will perform this on the switch instead.